Soon Nyarlathotep’s plans will come to fruition. Then the world will be changed irrevocably — but not quite yet. Pesky human investigators have learned much, but they must survive long enough to make sense of what they know, and take resolute action. This roleplaying classic is a series of linked adventures forming one long and unforgettable Call of Cthulhu campaign. Horrifying deeds and dangerous sorcery dog those who dare attempt to unravel the fate of the Carlyle Expedition. The non-linear narrative keeps players baffled and on their toes. Action is the byword as the player-characters evade or combat cultists, magic, mad men, and the dread powers of the Outer Gods. 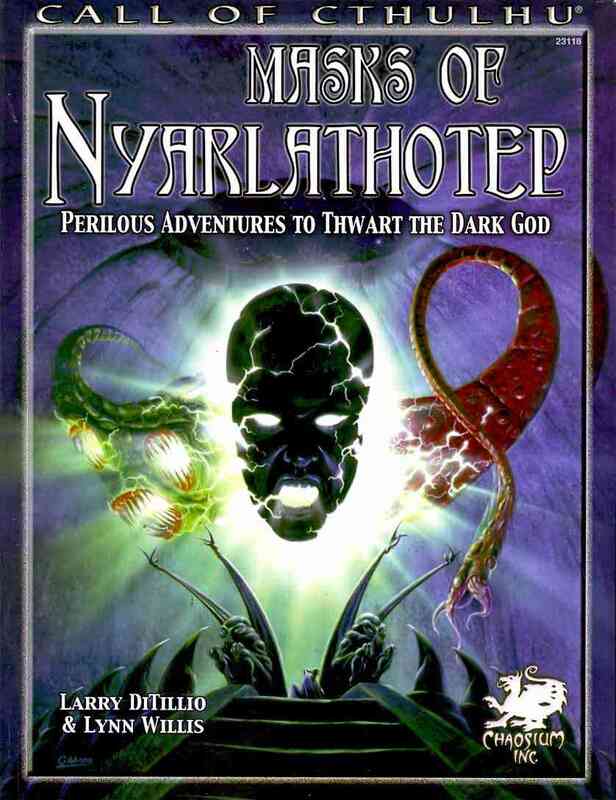 Masks of Nyarlathotep is a Lovecraftian exercise in horror and mystery. Set in 1925, adventures begin in New York, then move overseas to England, Egypt, Kenya Colony, Shanghai, and western Australia. Such extended globetrotting requires wit and planning by the players. Their investigators must have steady finances, good language skills, and a willingness to persevere despite governmental interference and cultist harassment. Meanwhile the keeper must bring to life different exotic locales, recreate the sensibilities of other cultures, and balance non-player-character foes and friends to allow each investigator to earn his or her own destiny — ultimate triumph, perhaps, or perhaps madness and agonizing death. Masks of Nyarlathotep is a classic Call of Cthulhu campaign, run thousands of times over the years by thousands of different groups. So to change things up, we are tackling the campaign using Trail of Cthulhu. We’ve also added in many elements from other books. This is Masks as you’ve never seen before! Before diving into the campaign cold, we started with a few scenarios. These prequel games establish who the characters are, why they know each other and why they’re looking into the Cthulhu Mythos. Shanghai Bullets:A priest dies a horrible death in Shanghai. A disparate group of his friends and associates meet to find out the true cause of his death. They find a horrific artifact. Can they find it before the gangs of the city do? Dream Factory Part 1: Barely fleeing Shanghai with their lives, the investigators soon find themselves in a case involving a missing actress. Dream Factory Part 2: Cults and Hollywood do not mix, but stopping a powerful cult leader and rescuing the actress may be mutually exclusive goals. New York – Episode 1: A meeting with Jackson Elias in New York leads to a confrontation with the Cult of the Bloody Tongue. What is the cult’s goal and how can the investigators stop them? New York – Episode 2: The investigators protect Erica Carlyle from a horde of angry cultists after enlisting strange allies of their own. New York – Episode 3: The Order of the Silver Twilight holds many secrets. Our heroes infiltrate the group’s lodge in Boston, only to uncover dark secrets. New York – Episode 4: Old enemies return! The investigators track them down to stop them once and for all. London – Episode 6: Delving into the secrets of the Penhew Foundation is not without its risk..
London – Episode 7: The investigators are forced to play a deadly game of cat and mouse with the Brotherhood of the Black Pharaoh. London – Episode 8: A brief sojourn into the English countryside results in an odd discovery and a terrifying battle on a train. Kenya – Episode 9:The investigators arrive in Mombasa and find dark forces waiting for them. However, they have other plans in mind. Kenya – Episode 11: A safari through the African wilderness, on the way to the Mountain of the Black Wind. What could go wrong? Kenya – Episode 12: Many things go wrong at the Mountain of the Black Wind. The Evac: A special one shot run for Patreon backers. Australia – Episode 14: After arriving in Australia, the investigators prepare for their expedition into the Outback but a strange creature stalks them in the dark. Australia – Episode 15: Leaving civilization behind, the Outback is perhaps safer than the city, but it holds its own dangers. Australia – Episode 16: The ruins of a vast alien city lie buried under the desert! The investigators have found it, but they aren’t the first to discover it. Australia – Episode 17: The fate of the earth depends on a battle between heroic investigators and fanatical cultists in a dead city. Shanghai – Episode 18: There is only one loose thread left in the conspiracy and it leads to Shanghai. Returning to the city where it all began has its own problems of course. Shanghai – Episode 19: New allies are recruited and a mysterious ship is investigated. Plus, a rescue mission from a cult stronghold! Shanghai – Episode 20: An isolated island, filled with cultists and monsters. A doomsday plot that could end the world. One last time unto the breach!